The notorious Ivan the Terrible almost married Elizabeth I, but things got complicated. Here's our story about who married whom, and who's related to whom in the British and Russian royal families. Most history buffs know that a close friendship between England and Russia started in the 16th century when an English delegation led by Sir Richard Chancellor, who was in search of a route to India, landed in the north of Russia. That was how trade links between the two countries began. The Old English Court, which is a building near the Kremlin that once served as the premises of the Muscovy Company, still stands (and now is a museum). While the above is the story that most people know. Russia Beyond can reveal that, in fact, relations between the two countries date to the 11th century. Gytha, the daughter of the last Anglo-Saxon king, Harold Godwinson, fled to Continental Europe after her father was killed in battle, and his dynasty de facto came to an end. In 1074, her uncle, the King of Denmark, married her to Prince Vladimir Monomakh. The future Grand Prince of Kievan Rus and the English princess had five children. So, Gytha can be regarded, for example, as the ancestor of the great Alexander Nevsky. There is also a legend that she was the mother of Yuri Dolgorukiy, the founder of Moscow, but that's not true - he was born to Vladimir Monomakh's second wife. The unapproachable and distant Queen was the only woman with whom the formidable Tsar corresponded. Their epistolary friendship continued for 22 years (1561-1583), until Ivan's death. (She then continued to correspond with his son, Tsar Feodor I, from 1584-1597). By and large, they discussed the two countries' trade affairs and problems encountered by merchants. Some "secret affairs of great importance" were also mentioned in their correspondence, and that has allowed historians to assume that Ivan, through mediators, proposed marriage to Elizabeth, but that she must have turned him down. There's even a legend that the Queen was sent a portrait of the Tsar but didn't like it. By the way, just like Elizabeth's father, Henry VIII, Ivan the Terrible had numerous wives; although, admittedly, he didn't execute them, but confined them to a convent. The first Emperor of Russia arrived in England in 1698 at William's personal invitation. As part of his "tour" of Europe, Peter had already learned the craft of shipbuilding from the most skilled masters in Holland, and observed how hospitals, schools and different factories functioned and how windmills worked. In England, Peter continued to learn shipbuilding and studied naval affairs. So, it can be said that Russia is partly indebted to England for some of Peter's famous innovations. From that trip there also remains a famous portrait of the Tsar by Godfrey Kneller. You can read how Peter built his navy with English tobacco money here. Emperor Alexander II married his beloved daughter, Maria, to Queen Victoria's second son, Prince Alfred, Duke of Edinburgh. A row broke out in London when the loving Russian father demanded that Maria be addressed at court as "Your Imperial Highness," because she acquired this title at birth. Moreover, both Alexander II and Maria deeply resented the fact that her position at court was inferior to that of the daughter of the King of Denmark - the spouse of Victoria's first son, Albert (the future King Edward VII). Queen Victoria was enraged because by marriage Maria was supposed to have the title "Your Royal Highness," but she gave in and the Russian Duchess was called "Her Imperial and Royal Highness." A bit long-winded, but fair. Still, Maria failed to gain precedence over Albert's spouse. These first cousins looked more like twins. Their facial resemblance was striking. The future British monarch was the grandson of the "Grandmother of Europe," Queen Victoria, through her son, Prince Albert (the future Edward VII) and the Princess of Denmark mentioned in the previous chapter. The sister of the Princess of Denmark was Maria Feodorovna, consort of Emperor Alexander III and mother of Nicholas II. Nicholas had several top British honors bestowed on him - Queen Victoria proclaimed him Knight of the Garter, King Edward VII awarded his nephew the title of Honorary Admiral of the British Navy, and at the height of World War I his cousin George dubbed Nicholas Field Marshal of the British Army. The spouse of Nicholas II, Alexandra Feodorovna, Princess Alix of Hesse and by Rhine, was at the same time yet another granddaughter of Queen Victoria - i.e. another first cousin of George V. She was the daughter of Alice, Victoria's second daughter. Nicholas and Alexandra met in Russia when the young princess attended the wedding of her elder sister, Ella, and Grand Duke Sergei, Nicholas's uncle. The future emperor was meant to marry a different woman but he liked Alix, and her sister helped the young lovers to correspond. Nicholas' father, Alexander III, was in ill health, and he decided not to delay and blessed the marriage. The young couple married hastily after the Emperor's death, raising eyebrows at court. On the day of their wedding, the Khodynka disaster occurred - thousands of people died in a stampede for free trinkets. Nicholas, Alexandra and all their children died at the hands of Bolshevik executioners. 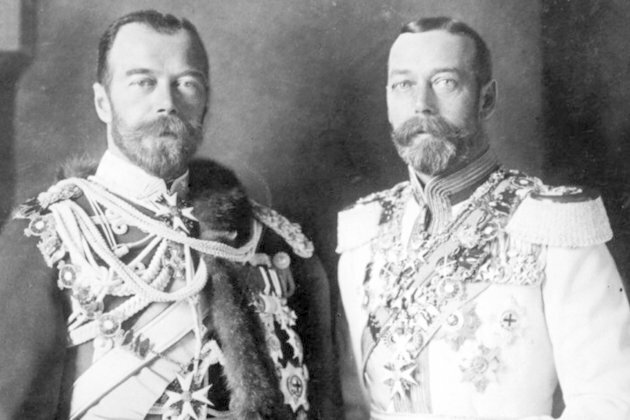 Despite their family connections, George V didn't give asylum to his cousins after the 1917 October Revolution. FYI: Exhibition 'Russia: Royalty & The Romanovs' to be held in The Queen's Gallery at Buckingham Palace from Nov. 9, 2018 to April 28, 2019. Read more: 14 Brits who are secretly Russians If using any of Russia Beyond's content, partly or in full, always provide an active hyperlink to the original material.